If you’ve been paying attention to a bit of Concern’s work, you’ll have noticed that we talk about kits quite a lot — particularly the hygiene and non-food item types. But what exactly are they? And why do we use them so much? Read on to find out more. Each year, Concern helps hundreds of thousands of people suffering the devastating effects of disaster and conflict. How do we help so many? Part of the answer lies in the distribution of essential survival items to communities in need. More often than not, we do this by distributing what is known as a “kit.” There are many different kinds of kits: hygiene, food, non-food item, and winterization, among others — more on those later. So, what’s a kit anyway? The contents correspond with the community’s needs. In this case: shelter, cooking utensils, and clothing. 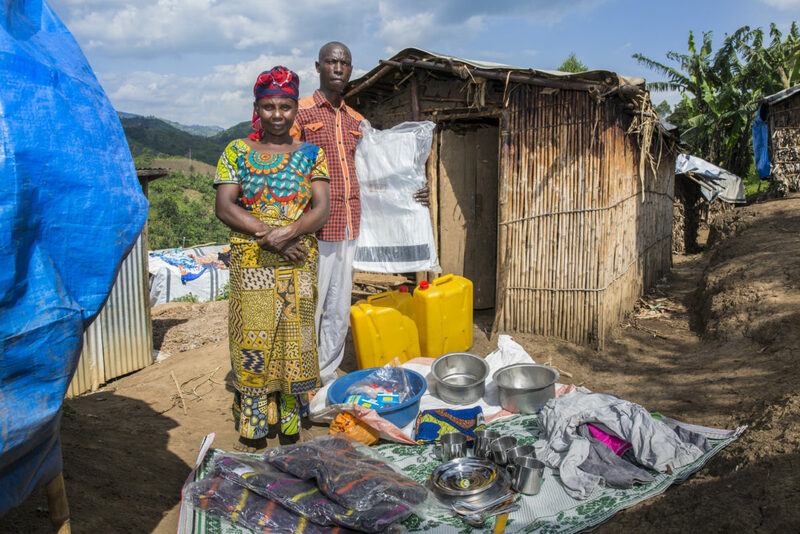 In Masisi, DRC, families fleeing conflict found themselves in displacement camps with little more than the clothes on their backs. People desperately needed tarpaulins to build or fortify their shelters, as well as crockery, a way to collect and store clean water, hygiene items, and feminine products. In this case, we also included a “pagne” (similar to a sarong) as these are the traditional clothing item for women in DRC, and they’re also used in many other important ways — for example, they’re often made into a sling for mothers to carry their babies on their backs while they work. What are the different types of kits? Not all needs can be filled in one kit, which is why there are so many different kinds. In places where there is food insecurity, there might be a distribution of food kits, full of things like oil, salt, corn meal, or lentils. During a cholera outbreak, Concern might distribute hygiene kits. This kit was recently distributed in Freetown, Sierra Leone, which had been hit with floods and mudslides that contaminated water points. 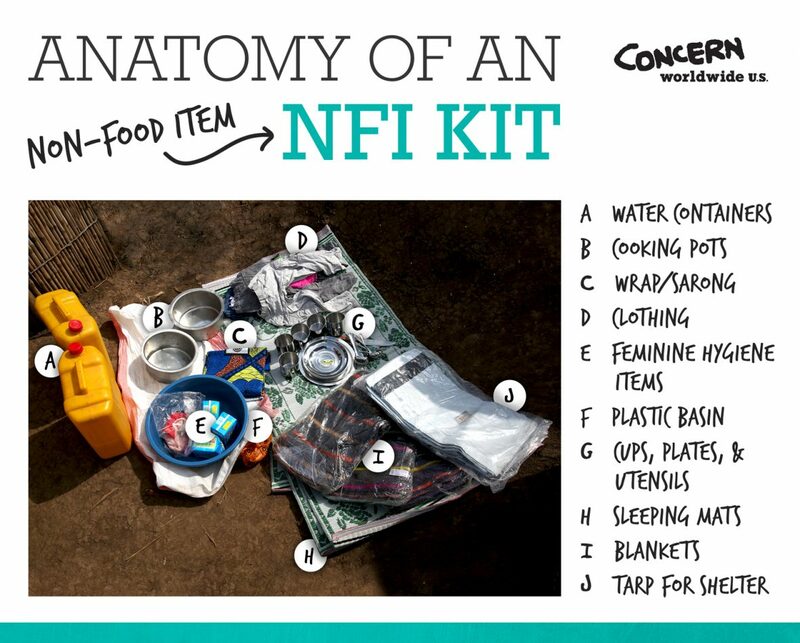 This hygiene kit is full of items to make sure that a family can safely clean their clothes and cookware, and has Aquatabs (water purification tablets) so families can purify their own water. It also contains spigots, so that the buckets included can be transformed into Veronica buckets for handwashing. There are kits for almost every need. School kits, food kits, non-food item (NFI) kits, hygiene kits, and shelter kits are just a few of the many kits that are distributed around the world. How does Concern decide what goes in a kit — and who receives it? Before Concern does a distribution, we make sure to do a “needs assessment.” This is essentially a big survey where we talk to the community and find out what they need most. But that’s not all. These talks with the community also help us identify who in the area might need the most help. With these assessments in hand, we create kits that address the biggest needs — and help the people that need it most. Why are kits so useful? It can be pretty difficult to ensure that families on the run from violence or on the move after natural disaster get the items they need to rebuild. Not only are these populations highly mobile, they also have urgent and varied needs. Kits are an easy and efficient way to deliver to communities in need a large amount of goods in a pack that can be carried all at once. Kits are also critical to maintaining the dignity of the communities we work with — which is why in our kits you’ll find feminine hygiene products and culturally-appropriate clothing items. Do all organizations distribute the same kits? While humanitarian organizations adhere to a set of core standards, often the kits they deliver will vary. 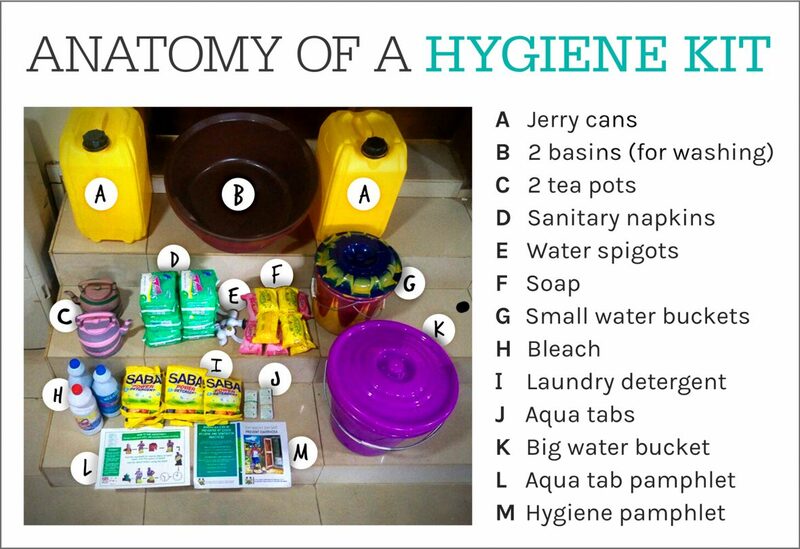 A hygiene kit distributed by one organization might focus on the needs of children or women, while another kit might have items for adults. And, depending on needs, kits might look different between countries. For example, we won’t give heavy blankets to people living in sweltering heat, or mosquito nets to communities in places where mosquitos aren’t a threat. 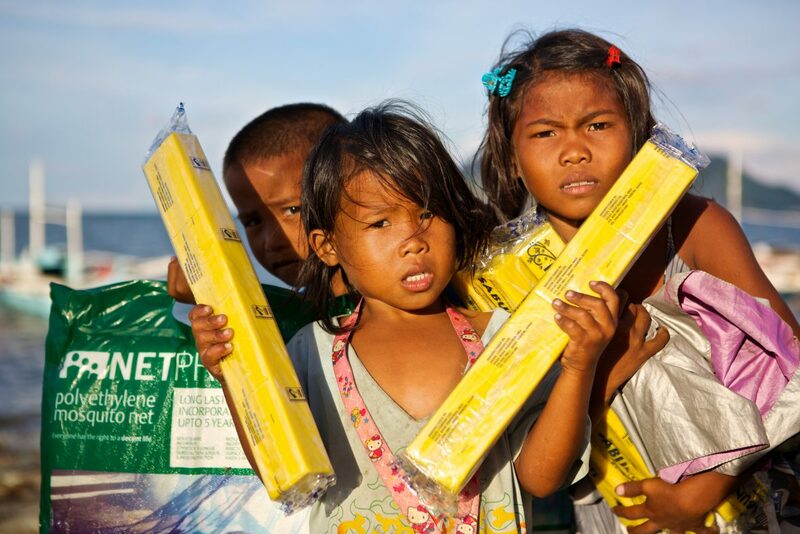 Each year, Concern distributes tens of thousands of kits to communities hard hit by disaster or conflict. They are a lifeline that helps families maintain decent living conditions by providing safe shelter, food to eat, and all the tools they might need to cook or gather water.